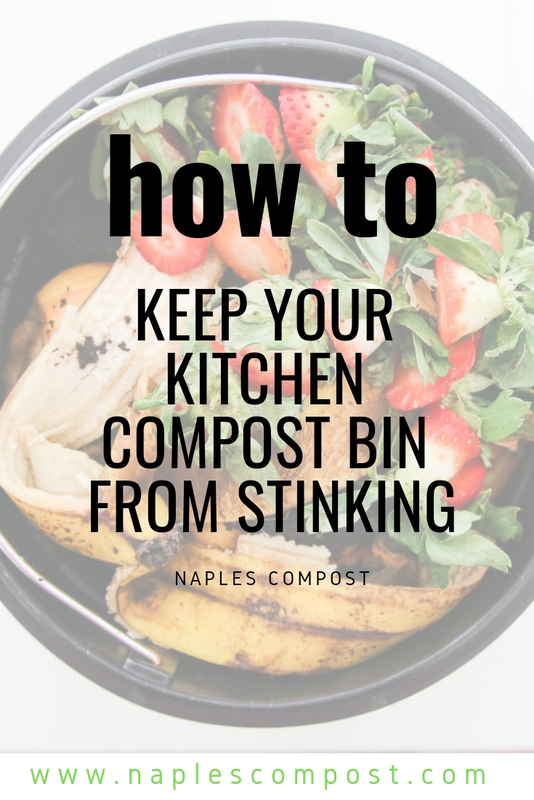 Stop asking yourself “why does my kitchen compost bin stink?” With a few of these tips you’ll have compost that doesn’t stink, and you’ll be able to enjoy the process of composting so much more. Done correctly, compost shouldn’t stink. You should never, ever have smelly compost. If you do have a smelly compost bin, it means you are doing something wrong. We have simple solutions that will help you keep your compost bins from getting stinky. Outdoor compost bins should smell earthy while indoor compost bins should be emptied quick enough to avoid a stinky kitchen. Even if you empty your kitchen compost bin often, it can still end up stinking from time to time. Don’t let this happen to you! Follow our best tips to keep your kitchen compost from smelling. How do I stop my indoor compost from smelling? First you need to understand why compost gets stinky in the first place. The type of scraps that you add to your countertop compost bin is considered “green waste”. Too much green waste in a compost bin can smell like sewage or ammonia as it breaks down. If you are composting correctly, then you are adding your green waste to brown waste in an outdoor compost bin in a ratio of 1:3. For every bucketful of green waste you add to your bin, you should add 3 bucketfuls of brown waste. The easiest way to add brown waste to your bin is to add newspaper, brown paper bags, or brown lawn waste. The best way to combat a stinky indoor compost bin is to be proactive. 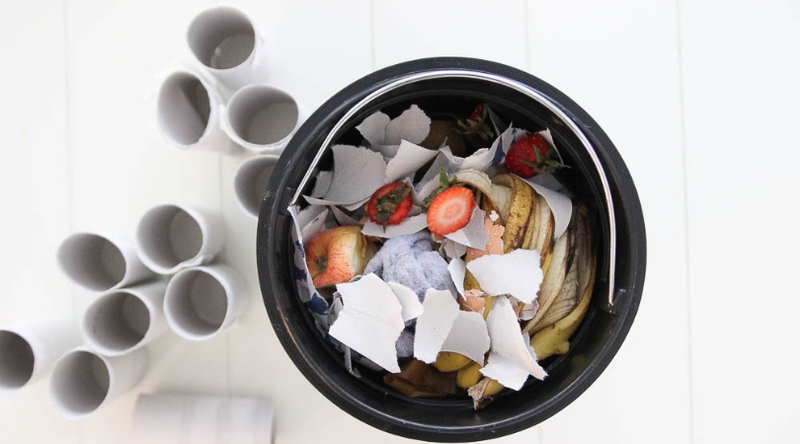 These tips can help you avoid a smelly countertop compost bin. This is the #1 tip that you need for composting indoors with a countertop compost bin. We recommend this compost bin. It’s the one that we give away for free to all of our Naples Compost pick-up service customers. You can order your own here, or if you are local to Naples, email us and we can sell you one for a discount! The reason we recommend this bin is that is has a removable liner that is dishwasher safe, and it has a spot for a charcoal filter. Being able to clean the liner exceptionally well keeps food from getting trapped in tight corners and decaying into a smelly mess. The charcoal filters add an extra bonus because they filter smells if you happen to have a smelly compost bin. Even if you don’t routinely have stinky indoor compost, it’s a good idea to replace the charcoal filters every 4-6 months. They lose their power by then. You can order an affordable set of charcoal filters here. Your outdoor compost bin needs brown waste so go ahead and add some to your countertop bin. This will keep your compost from getting too wet and making nasty smelling slime mold. Food will start to decompose after 3 days or so. If you don’t add browns to your indoor compost bin then it will start to smell like sewage. Avoid this by adding your food waste from your indoor compost bin to your outdoor compost bin every 2-3 days. If you don’t have an outdoor compost bin, you might want to use compostable bags. Every 2-3 days, you can tie off the bag and start another one. The bags will keep the food from getting stinky, allowing you to keep it on your countertop longer. If you have more waste each week than the size of the countertop bin provided, ask your compost pickup service to provide a 5 gallon paint bucket with a lid. We offer this to our family sized customers. This allows them to empty their countertop compost bin often. We pick up their bucket each week and replace it with a clean bucket. We recommend these compostable bags. Wash that liner well after each use. You need to make sure to wash it with soapy water and a little bleach, or run it through the dishwasher to get sanitized. This will make a drastic difference in the smell of your bin! It will take some trial and error to get to figure out the best way to keep your compost bin from stinking. These tips will definitely help you get on the right track. Don’t forget to follow us on social media (Facebook, Instagram, and Twitter) to see more of what we love. If you like this post, you’ll love our social media accounts too! Want to know another way you can see more of what I love? Follow us on Pinterest. We’d also love for you to pin this post to Pinterest if you liked it!